Chevrolet Corvette PDF Workshop and Repair manuals, Wiring Diagrams, Spare Parts Catalogue, Fault codes free download! Chevrolet Corvette – a two-wheel-drive sports car, produced under the brand Chevrolet by General Motors in the US since 1953. Nowadays, Chevrolet Corvette cars are assembled at General Motors plants in Bowling Green, Kentucky (main factory), Flint, Michigan and St. Louis, Missouri. The car is the first American sports car created by the American manufacturer. In the city of Bowling Green, there is the National Corvette Museum. At the Motorama exhibition in 1953, the roadster Chevrolet Corvette was introduced. He received a fiberglass body, mounted on a shortened version of the frame chassis from the serial “Chevrolet”, a straight six-cylinder engine with a volume of 3.9 liters capacity of 152 liters. from. and a two-speed automatic transmission Powerglide. 300 copies were built, all cars were painted white. It is believed that the main merit in the success of this model belongs to the famous racing driver Zora (Zachary) Arkus-Dantov. He adapted for Corvette the newest engine of the family Small Block – 4.3-liter carburetor V8, as well as a 3-speed manual transmission. And from 1957 on the car began to install a V8 injector engine with a volume of 4.6 liters and a 4-speed manual transmission. Both variants were produced only with a roadster. Over the Corvette C2 Sting Ray, Larry Shinoda (creator of the Ford Mustang Boss 302) and Bill Mitchell worked. Their efforts the model received an independent two-link suspension on the transverse springs and motors of the V8 family of the Big Block – first 425-strong 6.5-liter, and then – 435-strong volume of 7 liters, equipped with built-in carburetor Tri Power. C2 was produced in coupe and cabriolet. A total of 117 964 cars were produced. In 1963, the Grand Sport version was released. It was built only 5 copies, equipped with a V8 engine with four Weber carburettors with a volume of 377 cu. inches (6.2 liters), developing 550 liters. from. 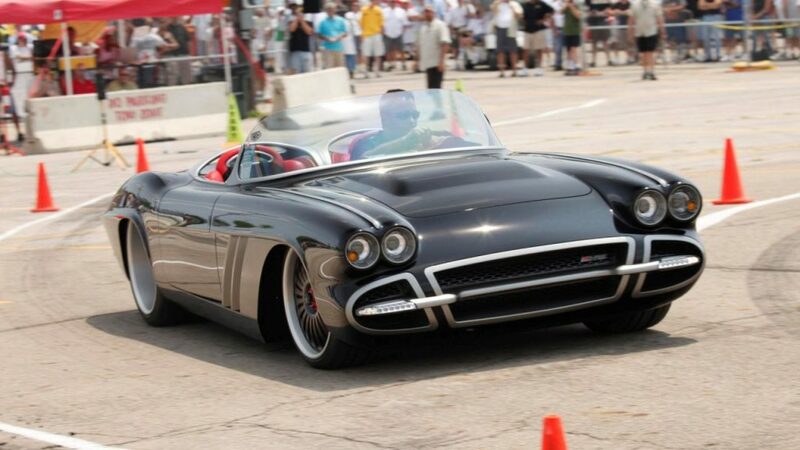 The third Corvette is based on the Mako Shark II concept of 1965, created by David Halls. Initially, C3 was based on aggregates C2. In 1969, a new Small Block with a volume of 5.7 liters (300 hp), and later – Big Block (7 liters, 390 hp) appeared. In 1972, the standards for measuring the power of motors were changed, according to which the most powerful 7.4-liter engine developed 270 liters. s, and the Small Block engine with a maximum of 205 liters. from. With the introduction of new fuel taxes, huge multi-liter Big Block is a thing of the past. The volume of output С3 amounted to 542 861 units. Also, a version of the Corvette ZR1 (specifically for racing) was released. The engine produced a capacity of 430 liters. from. The specimen shown on the photo belongs to the limited series 25th anniversary, released in silver metallic color on the 25th anniversary of the first Corvette. The fourth Corvette was not as revolutionary externally as the previous generation, but it had a well-thought-out aerodynamics and technical part. 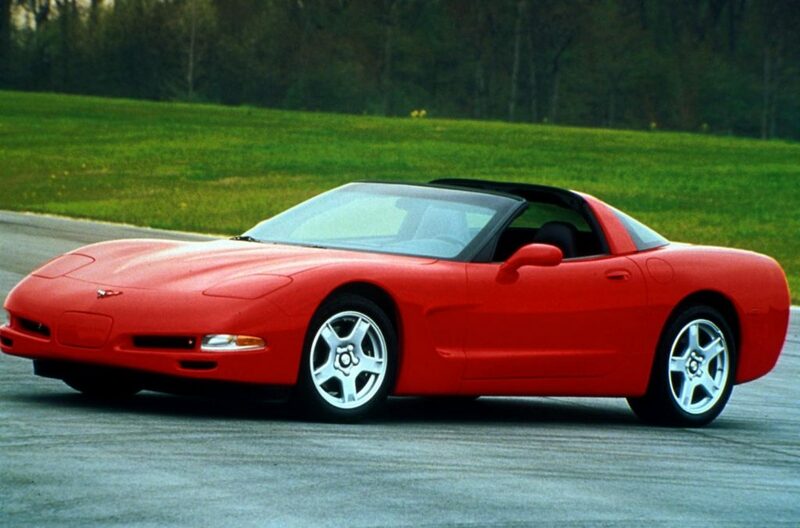 This generation of Corvette was completed with a new 5.7-liter 230-liter engine. from. In 1986, a roadster body appeared with a tent top. A total of 358,180 copies were produced. In 1990, based on the C4 was released Corvette ZR1, equipped with 375-horsepower V8 LT5 with aluminum block heads, developed in collaboration with the company Lotus. Camshafts (two per block) were in the head, and each cylinder had 4 valves, which is unusual for the American engine building. Also in 1996, the limited edition Chevrolet Corvette C4 Grand Sport, named after the 1963 model of the same name, was released. It was released only 1000 copies: 810 with a coupe and 190 roadsters. Model C5, developed by engineer Dave Hill and designer John Caffaro, has received a new platform – a suspension on the transverse carbon springs, a monocoque on a powerful spatial frame, a transaxle arrangement with a 6-speed Tremec T56 gearbox, assigned to the rear axle. An interesting feature of the new platform is the construction of the floor, which is a “sandwich” of two layers of metal, between which is clamped a plate of balsa wood. The balsa was chosen because it absorbs the vibrations perfectly. 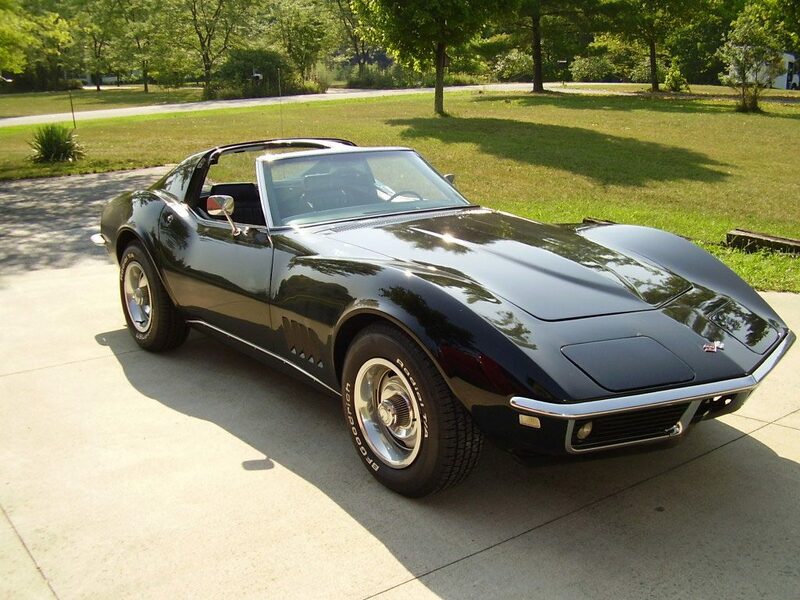 The standard version was equipped with an LS1 engine (V8, 5.7 liters, 345 hp), and the Z06 version with an LS6 engine (V8, 5.7 liter capacity, 385 hp). From 2002 to 2004, the upgraded LS6 engine with a capacity of 405 liters was installed on the Z06 version. from. Also Z06 differed in the suspension scheme – aluminum springs were used; the power skeleton was also changed. It was built 247 851 C5 Corvette in coupés and cabriolet. For the FIA ​​GT and ALMS series on the basis of the C5 in the Z06 version, a GT1 class car, the Chevrolet Corvette C5.R, was built. At the Auto Show in Detroit in January 2004, the Corvette C6 with coupés and cabriolet is presented. Built on the updated platform of the C5 model, which has the same suspension and the scheme with the rear-end gearbox, the C6 got a new 6.2-liter engine, developing 437 liters. from. and a torque of 585 Nm. In 2008, the model received a modernized transmission, an exhaust system, new versions of the body painting, design of wheel disks and improved interior decoration. On its basis, a modification of the Corvette Z06 was created. This version is distinguished by the extensive use of aluminum in the power elements of the cockpit, aluminum levers, as well as the 505-horsepower seven-liter LS7 engine; Based on this, the Corvette C6.R racing was prepared to participate in the ALMS series and the FIA ​​GT race, which won the Le Mans race in its class six times, as well as the Corvette ZR1, equipped with a compressor 6.2-liter LS9 engine developing 638 liters . from. The main drawback of modern Corvette models is the increased noise of the rear differential (due to its design). Chevrolet prepared a special modification of the supercar Corvette ZR1 for the charitable network Kids Wish Network, which was called Hero Edition. The car was created in a single copy and together with the classic roadster Chevrolet Corvette 427 1967 release was a prize in a special lottery. 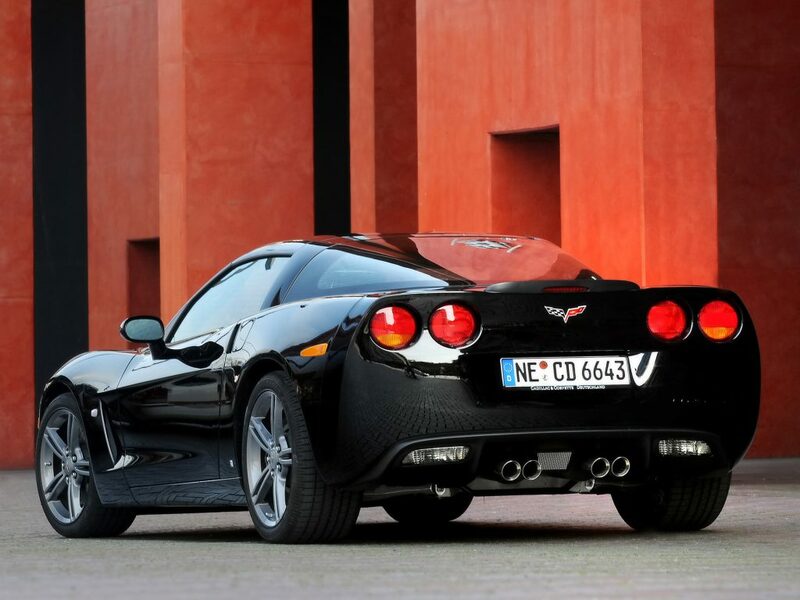 From the usual ZR1 modification is characterized by a special appearance of the exterior with red-orange stripes on the hood and trunk, made in a similar style with the engine cover, additional carbon overlays, as well as the badges on the body with the inscription “Hero Edition”. 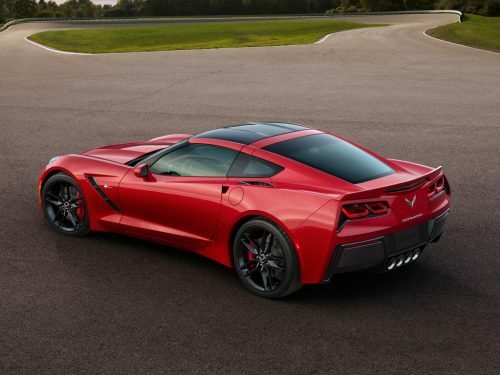 In addition, on the inside of the hood, their autographs were left by the engineers of Chevrolet, who participated in the development of the supercar Corvette. Technically, the novelty has not changed. In the USA, the cost of the lottery ticket was $ 3. The winners were named on December 23, 2009. According to Motor Trend, the release of the seventh generation was originally planned for the 2011 model year (to the 100th anniversary of Chevrolet), but its appearance was delayed. Chevrolet Corvette seventh generation was introduced January 13, 2013 at the North American International Auto Show. The new generation also received the prefix “Stingray” for the title, and the design was partially inherited from the concept car Stingray, which General Motors introduced in early 2009 at the Chicago Motor Show. The car is equipped with a new engine LT1 (V8, 6.2 liters, power 466 hp at 6000 rpm), which helps the car to accelerate from 0 to 100 km / h in 3.8 seconds. Two gearboxes are available to choose from: a 6-speed automatic or a 7-speed “mechanics”.